Linda Richards was America's first trained nurse and went on to become one of the most famous nurses in history by sharing her knowledge. 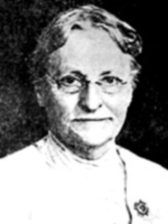 She was a pioneer in starting many nursing schools throughout the United States and one in Japan. Malinda Ann Judson Richards was born in 1841, the third of three children. Her father was a preacher who named her after a missionary with the hope that she would also go into the mission field. Although Richards was born in West Potsdam, New York, she moved with her family to Wisconsin in 1845. Just weeks after the move, her father died from tuberculosis forcing the family to move to Vermont to live with her grandparents. Shortly after that, her mother also contracted tuberculosis. Richards cared for her until her death in 1854 and became an orphan at the age of 13. Caring for her mother gave Richards an interest in nursing, but she did not initially pursue it as a career. Instead, she studied to be a teacher and taught for several years. In 1860, she became engaged to George Poole. Shortly after their engagement, he left to fight in the Civil War. During his service, he was severely wounded, and when he returned home, Richards took care of him until he died in 1869. These two personal losses reawakened Richards' interest in nursing, and she moved to Boston to fulfill her dream. She worked at Boston City Hospital but received very little training there, and the workload was overwhelming. In 1872, she heard about the first American nurses' training school that was being started at the New England Hospital for Women and Children by Dr. Susan Dimock. She was the first of five women to apply and the first to graduate. The training lasted one year and was very arduous. In Richards' Reminiscences, she reports that they had no textbooks and very little formal training. They were exposed to medical, surgical and obstetrical nursing and were instructed mostly by interns. In their year of training, they had 12 lectures by doctors. Student nurses were a novelty and resented by the older nurses who worked at the hospital. For part of the training, each student was in charge of a six-bed ward, 24 hours a day, seven days a week. Their rooms were between the wards, and they were required to get up at night if the patients needed anything. The students were up at 5:30 a.m. and did not leave the wards until 9 p.m. In spite of this, Richards speaks of the close friendships between students and the kindness of the founder, Dr. Dimock. Following her graduation, Richards became a night supervisor at Bellevue Hospital in New York. While there, she devised a charting system that eventually was used throughout the United States and Great Britain. In 1874, she returned to Boston and became the superintendent of the Boston Training School for Nurses. She improved their program but felt that she needed more education, so she went to England for an additional seven months of training. While there, she met with Florence Nightingale and visited several prestigious hospitals as well. After returning to the United States, Richards was a pioneer in establishing nursing schools throughout the country. In 1885, she traveled to Japan where she helped start their first nurses' training school. She stayed as supervisor at Doshisha Hospital in Kyoto before returning to America in 1890. She continued to work for an additional 20 years, establishing nursing schools and helping with institutions for the mentally ill, before retiring in 1911. Richards spent her retirement years writing about her nursing experiences until she had a severe stroke in 1923. The remainder of her life was spent in her training hospital in Boston where she died in 1930. Linda Richards spent her life improving her education and that of nurses' training schools. She was not content to just train nurses but wanted to educate them. She laid the foundation for modern nursing education.